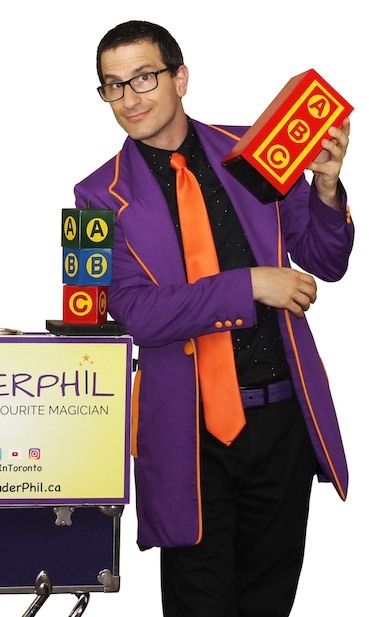 WonderPhil is a Toronto magician, and has been performing children’s and family magic shows for over 20 years. He’s now the most in demand magician for children’s parties in the GTA, performing at hundreds of birthdays and other private events every year. Along with private events, he’s a favourite at Toronto Public Library events, as well as daycares and summer camps. Over the years WonderPhil has won many awards for his magic, writing and other talents. These include A1 Media’s Toronto’s Best Magician Award, a Toronto Fringe Playwriting prize and a national playwriting award. You can checkout clips from his award winning magic act on his YouTube Channel. A lot of the fun of being a magician, is that there is always more to learn and discover. When he’s not practicing and performing his magic, WonderPhil will often be studying new material from magicians all over the world. In recent years, he’s also started teaching magic. Most of his lessons take the form of workshops at local libraries and for other specialty programs, but he also offers private at-home lessons. Tricks and magic are just the beginning. It’s the foundation on which WonderPhil builds his shows. On top of that foundation though is a ton of entertainment. His goal is to get the kids laughing, interacting, and helping to make the magic happen. This will not only help ensure they have an incredible time watching the show, but it means they’ll have special memories to last them a life time.